Lazy is tricked by the other Smurfs into believing he has slept his life away. A bunch of disgruntled Smurfs try to get even with a human army that has rampaged the village. Johan, Peewit, and the Smurfs search for the magic fountain to energize an enslaved people. The suggested retail price is $19.97, but you can preorder it on Amazon for $13.99 with free Super Saver Shipping. 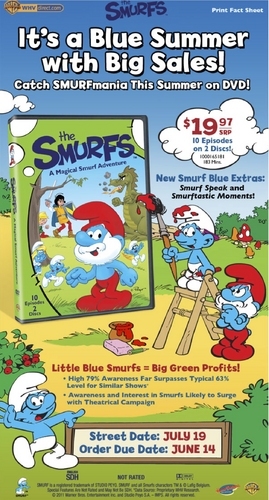 A Magical Smurf Adventure will be released July 19.